This is going to be short, so sit loosely. All I want to do here is tell you about a grommet machine I got from thediyoutlet.com. It was a gift, so this is sort-of a sponsored post. So I spent all of last week upcycling a pair of regular rain boots into a pair of fashion-forward, thigh-high wading boots. Like I did last year, except that this year I had the help of a grommet punching machine! And one thing I discovered about having a machine versus using a hammer and brick for punching grommets is that you can go to town with grommets and use them decoratively as well as functionally. I assure you, I would not have used 92 grommets if I hadn’t had a heavy-duty puncher. So much fun! See? SO MUCH EASIER than using a hammer and brick! In short, I recommend it highly. 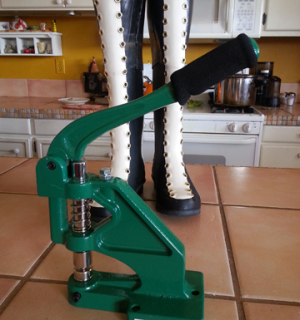 So, for all you diy freaks like me, here is a link so you can shop for your own grommet machine. Don’t worry… I’m not getting any kickbacks from sales. Just sharing a great tool.